In this chapter you’ll learn how to connect to your server via FTP (File Transfer Protocol) using the FileZilla program. Free versions of FileZilla are available for Windows, Mac OS X and GNU/Linux and these can be downloaded from the project’s website. A server installed with Symbiosis will be running SSH, and will have had the admin user account created. This allows you to connect via SFTP (SSH File Transfer Protocol) to administer the machine. The admin account should be used when administering a Symbiosis system to ensure that files and directories have the correct permissions. Usage of SFTP is mandated for administrating the machine, such that all data is passed encrypted over the network. Throughout the documentation the example server name example.vm.bytemark.co.uk should be substituted for your own server name. 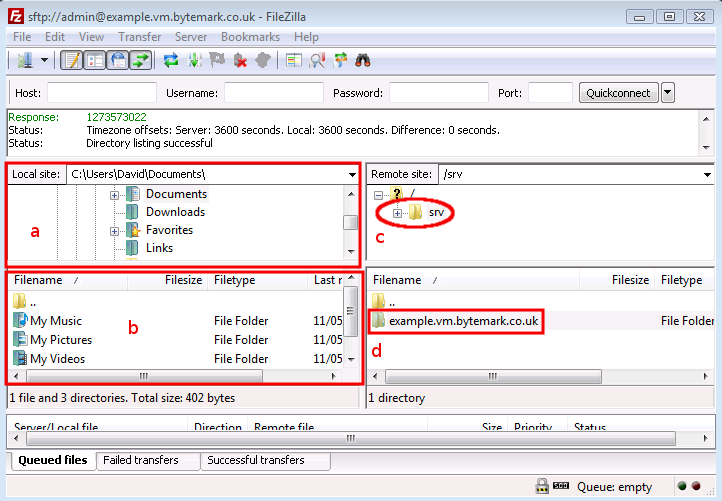 Start FileZilla and enter the details in the text fields below the program’s toolbar. The name of your server goes in the Host text field a and admin in the Username field b. 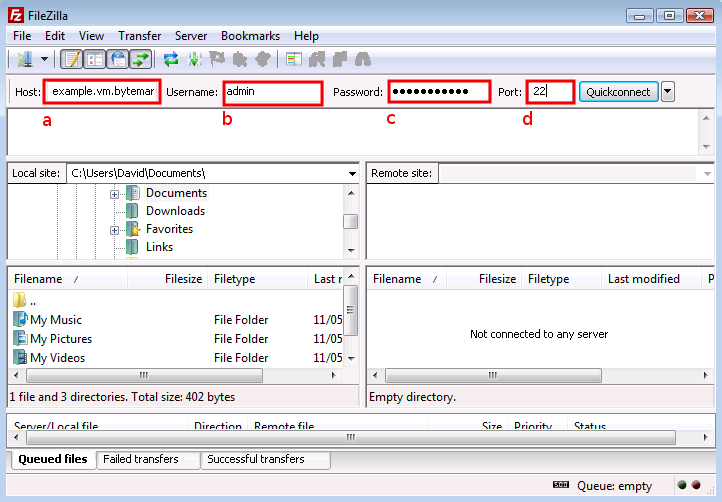 Complete the connection details by filling in the Password field c with the password for the admin user (by default, this is the same as the root password provided during the setup of your VM), and the standard SSH port number, 22 in the Port field d.
Click the Quickconnect button a to the right of the text fields; the first time you do this you’ll get a warning message that is safe to ignore, so check its Always trust… box b and click the OK button c.
In the text area immediately below the “Quickconnect bar” you’ll see messages scroll by as the connection to the server is made. Tip: You won’t need to enter those details each time you connect. 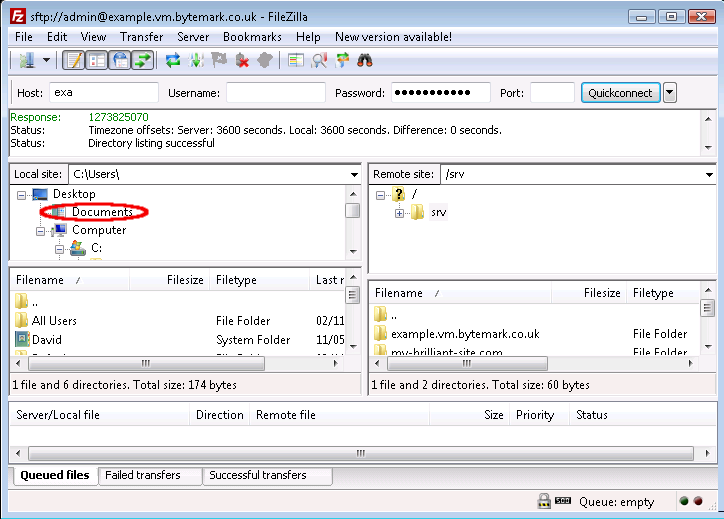 Click the small button to the right of the Quickconnect button to reveal the sftp://admin@example.vm.bytemark.co.uk as a history item. In future simply select that link. 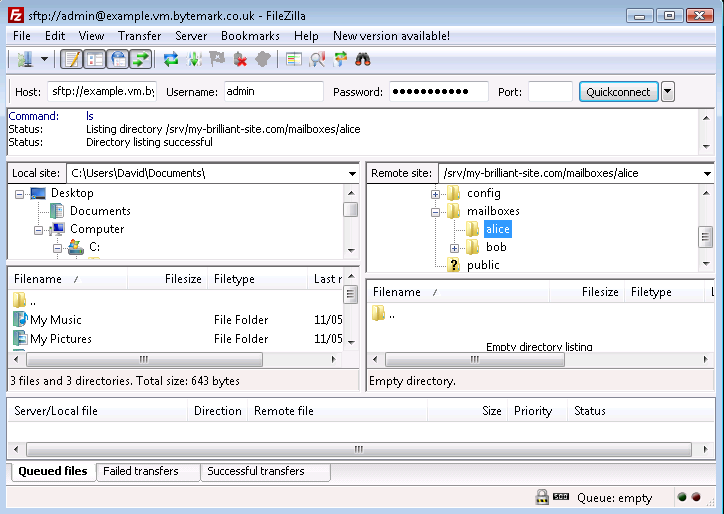 The following figure shows FileZilla’s layout after successfully logging in. The display is divided into four main sections, the top left pane shows a directory tree, with the directories on your local computer, labelled a. Beneath that is a listing showing the contents of the currently selected local directory, labelled b. Then the top right pane shows the directory tree of the remote machine. When logging in as admin this will show /srv/ (c). Finally beneath that is the contents of that directory. Initially this will only contain one directory named after the machine. 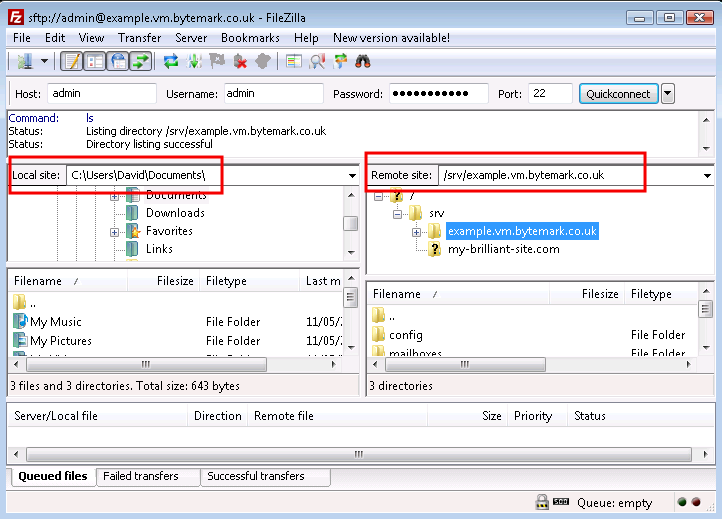 In this case example.vm.bytemark.co.uk/ is shown (d). 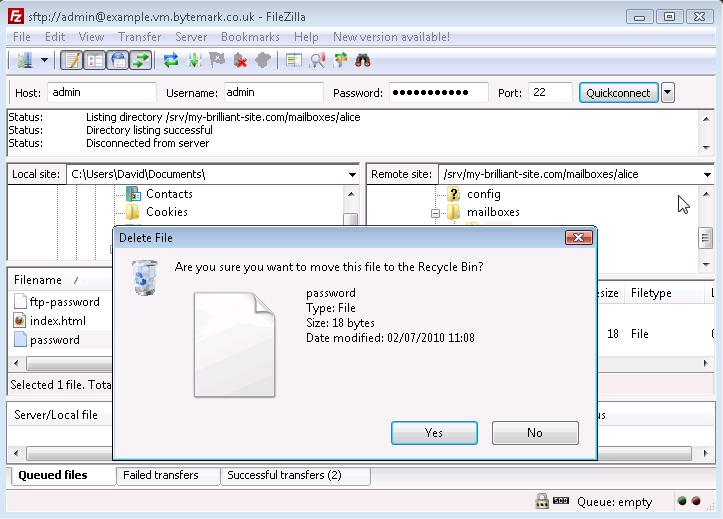 Once you’ve been able to successfully connect to your server, via FileZilla, you may proceed to configure email or setup your website. To open the /srv/ directory on the server, click the + icon. Notice that the folders that appear in the tree display are already displayed in the Filename window. You can use the scrollbars a and b to adjust the view; as in any desktop window you can also use the maximise window control c to expand the FileZilla display to full screen or just drag its corners in the usual way. 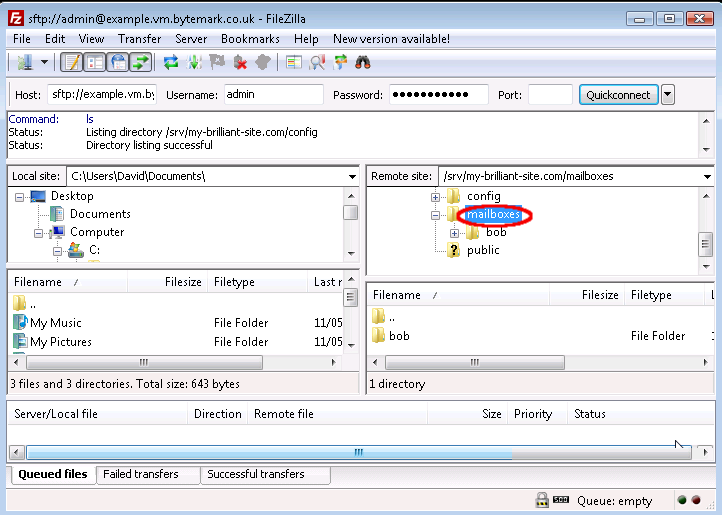 When you click on the example.vm.bytemark.co.uk label (not the directory icon), the + control appears. The contents of the directory are already displayed in the Filename window. Click the + control to see those contents as part of a tree view and notice that you now have a - control, which could be used to close this detail of the file system structure. Those operations were all carried out on the right side of the screen where the Remote site:, in this case the server example.vm.bytemark.co.uk, is represented. Comparable operations can be carried out on the left side of the screen, where the Local site:. represents the file system on the desktop machine. Highlight the parent directory by pointing at the mailboxes label (not the icon) and left-clicking. Right-click to bring up the menu and select Create directory. 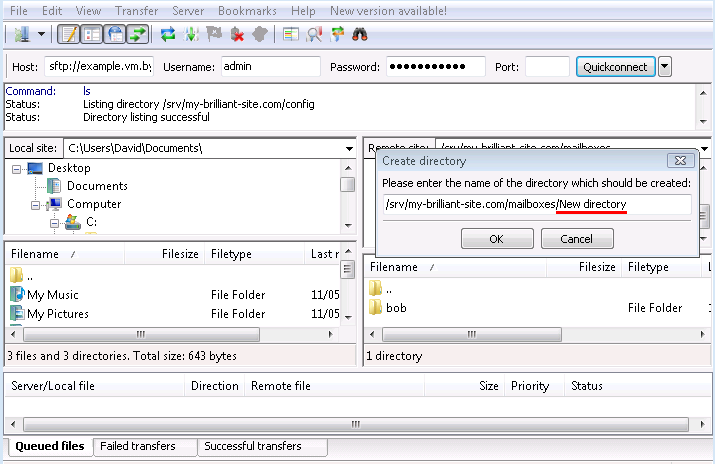 The Create directory dialog opens; the default path /srv/my-brilliant-site.com/mailboxes/. is as we want it, but not the default name New directory/. Edit that, replacing New directory/ with alice/, then click the OK button. The /srv/my-brilliant-site.com/mailboxes/alice/ has been created. The password file on the local machine is no longer needed; select and right click then choose the Delete option. Confirm that you do want to delete the file by pressing the Yes button in the Delete file dialog. The local password file has been deleted. In the same way files and also directories can be deleted from the server, the only difference being that the Confirmation needed dialog that comes up is less detailed than the local Delete file dialog. 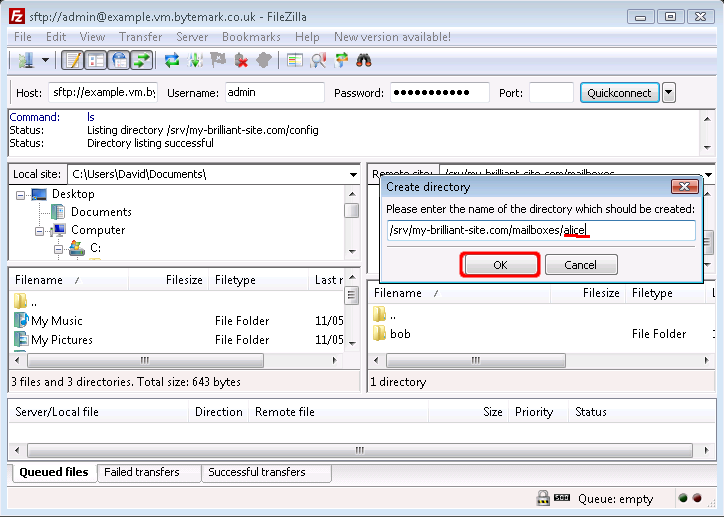 Below is what would be seen if user alice was to be removed; the alice/ directory and the Delete option have been selected. The Yes button in the Confirmation needed dialog was selected and the alice/ directory has been removed.